On Monday April 15, the UBC Bus Exchange opens to all diesel buses arriving to campus. Bus stops for #44, 84 and 68/70 shuttles will close on Student Union Boulevard starting April 15. The new stops for these routes will be permanently located in front of the Aquatic Centre within the Bus Exchange. Upon arrival to campus, pedestrians can walk north between the Student Recreation centre and Aquatic Centre or on the south side of the Aquatic Centre. The pathway connecting the bus exchange to University Boulevard will remain closed. 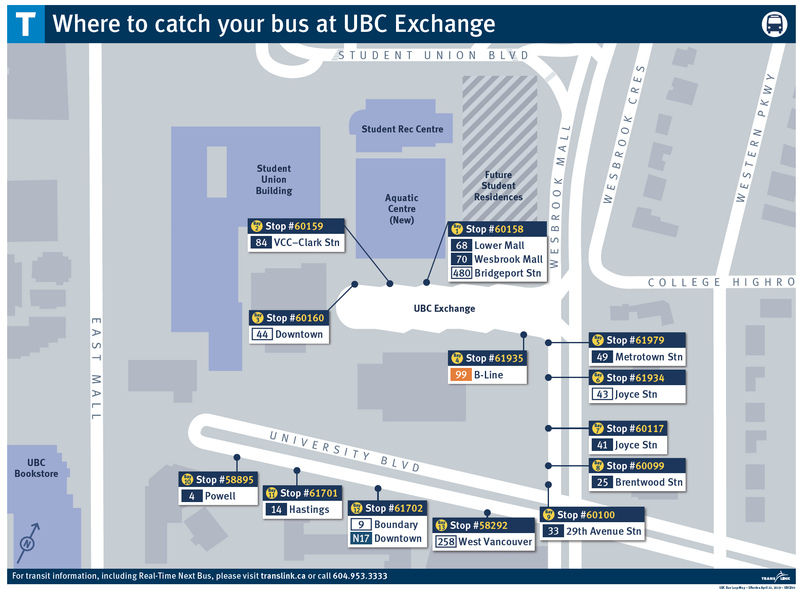 The UBC Bus Loop Map details where bus stops will be located. Some directional signage will also be put out around the construction area, but please forward this information widely to your networks. As previously announced, TransLink has been targeting fall 2019 for the launch of the region’s three new B-Lines and this remains a possibility. 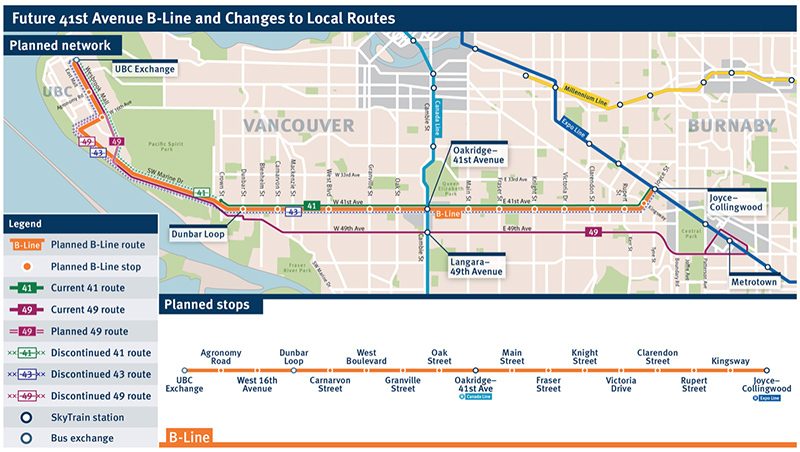 At this time, TransLink has updated this timeline and they may launch some or all of the new B-Line routes in mid-November 2019. However, it’s possible one or more may launch in early January 2020 or other dates in early 2020, if necessary. When TransLink confirms a date for the launch of the 41st Avenue B-Line from Joyce-Collingwood Station we will inform the UBC community. TransLink explains that the uncertainty in the launch schedule for the new B-Line routes are due to estimated construction timelines, combined with a tight construction market. After many years of being unable to expand the transit system, TransLink is now in the midst of the region’s biggest expansion in its history. They want to let the public know they are doing their best to roll out new services as quickly as possible to meet demand. However, as they move forward with projects, unforeseen circumstances sometimes influence their timelines. Visit TransLink for more information and to plan your trip to UBC.